A few years ago I noticed Metro Mint water in a local deli. Since I love mint I was an instant fan and was excited each time a new flavor showed up. That local deli no longer carries Metro Mint water and I can only assume it is because of the price. My regular grocery store does carry Metro Mint and today I bought the bottle shown above in the middle for $2.09. The last time I was at Trader Joe’s I was pleased to notice that they had their own brand of mint water for 99 cents. I decided to do a taste test to see how the two options measured up to my own version of mint water (recipe follows). In case you don’t know about mint water, it is plain water flavored with mint essence and nothing else. The no added sugar was one of the main reasons I love mint water. Trader Joe’s Mint Water: After the initial taste which tasted like mouthwash the rest of the bottle was not so harsh. Maybe it was because the first taste overloaded my taste buds. The water is flavored with spearmint. I would buy it again but only because of the price if I needed some bottled water for something like a long road trip. 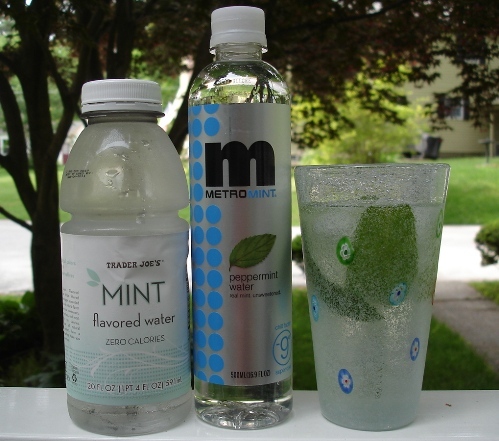 Metro Mint Peppermint Water: The peppermint water boasts the greatest cool-down effect of the Metro Mint flavors and it was the first one that I tried. I used to refill the bottles and the refill would still taste minty. Several of my friends in the office also jumped on the Metro Mint band-wagon. I am very accustomed to the flavor of this water but I do know that my friends who have tried it for the first time report the same mouthwash reaction as I mentioned on the Trader Joe’s Mint water. I have a really hard time justifying paying over $2.00 for a bottle of water. Yes, it is a really pretty bottle and it feels nice in your hand but really? My favorite flavor of the Metro Mint line is Cherry Mint and my grocery store doesn’t carry it so when I see it (usually in an airport) I will splurge. 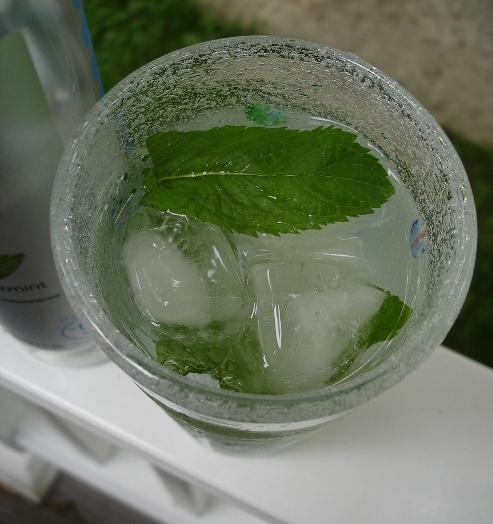 My Own Mint Water: This is so easy to make yourself if you grow mint in your garden like I do. We have spearmint and it is really like a weed. The more you harvest it the more it grows. My kids love to pull leaves of mint and run inside to request some mint water. This proves that no sugar is needed to satisfy their tastes. This is free version of mint water without any plastic bottles to recycle. My choice is the recipe below. A cooling and refreshing summer drink that my kids love. Place the mint leaves in a glass and fill with water and ice. How easy is that? I, too, am a fan of Metro Mint but consider it a splurge because of the price. My girls and I will be drinking our own simple concoction thanks to you all summer! my name is Peace from Nigeria. i want to go into production of mint water in my country. Looks good will try this come the summer, and thanks didn’t know the more you pick the more it havrvest. Would explain a lot. Another fantastic flavored water is sliced peeled cucumber along with strawberries. Pretty too. 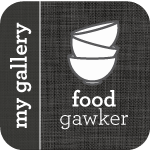 The recipe you suggest I will make..thanks! I love the cherry mint metro mint as well and wonder if soaking a few cherries inthe mint water would do the trick…. I would think that some chopped up cherries would be a nice addition. I have been trying the mint thing lately and I love it too. I put lemon in mine with 1 splenda pack. Its delicious, i will try other fruit like fresh peaches and apples but so far the lemon is a plus. I am in this health class and one of the members dicussed different ways to drink water since she gave up sodas and sweet drinks. Mint water has a little bitter taste to me thats why I added 1 splenda in it to give it that extra push. Thanks for adding in that detail about crumpling up the leaves. That may have been exactly what I’m missing. I have tons of the greatest smelling mint, but it doesn’t seem to add much flavor. I’ll try the leaf crumple. Yes!!! I’ve been looking for more ideas on flavoring water and currently, I’m working on saving money, so this is a win-win!! I have tons of mint in the garden. Thanks!!! !